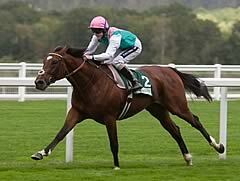 Frankel extended his unbeaten record to 12 with another awesome performance in the Qipco Sussex Stakes at Glorious Goodwood. Following his 11-length demolition job in the Queen Anne Stakes at Royal Ascot, the world's highest-rated racehorse faced just three rivals as he defended his Goodwood crown, including his pacemaker Bullet Train. The latter predictably cut out the early running, but Tom Queally was never too far behind on Frankel in second and the 1-20 favourite eased to the front with a couple of furlongs to travel. The result was never in doubt thereafter as Sir Henry Cecil's incredible four-year-old engaged top gear to pull right away in the closing stages. 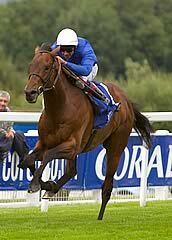 Godolphin's Farhh (11-1) came through to finish a distant six-length second. Queally said: "Every moment spent on his back is a special moment and today was no different. He's amazing, he had all the other horses cooked just after halfway and it was a nice prep for his next race. "He's a class apart from anything else at the moment, he does it all very easily therefore I have a very easy job, all I have to do is steer. These are magic moments and it's great to be part of it." Teddy Grimthorpe, owner Khalid Abdullah's racing manager, said: "It was set up really, really well. Bullet Train went a nice gallop for him and he just increased when he needed to. "Tom let him roll down the hill and then let out a few inches of rein, then he just quickened as he does which is so fantastic - he put it to bed in a few strides, which is him. It's a pleasure to watch him. He's much more mature, both mentally and physically. "Henry and everyone at Warren Place have done a fantastic job, it's been a great effort to get him spot on. I think it's hugely exciting that he's going to step up in trip (for the Juddmonte International), it's a new challenge for him and it's what everybody wants to see him do and he's ready to do it. "We are lucky to have him and racing is fortunate, he's just a remarkable equine." In becoming the first horse to win the QIPCO Sussex Stakes at Goodwood for the second time, Frankel took his unbeaten run to 12. His sequence, notable in the modern era, puts him high on that particular numerical leaderboard, but not yet at the top. The record for an unbeaten career is held by 1874-foaled Kincsem, a Hungarian-trained mare who won all 54 of her races. She was campaigned all over Europe and on her sole visit to Britain won the 1878 Goodwood Cup by an easy two lengths, despite being left half a furlong at the start. Next best is the Australian sprinter Black Caviar, winner of the Diamond Jubilee Stakes at Royal Ascot in June, and currently 22 from 22. 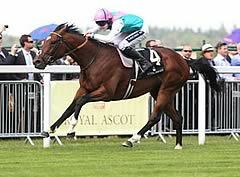 Among unbeaten Flat-race horses trained in Britain, Eclipse (foaled in 1764) still reigns supreme with 18 victories. The 19th century paragon Ormonde (1883) won 16 races. Two British-trained champions won their first 15 races before meeting defeat. The peerless Pretty Polly (1901) took nine races as a juvenile, then the 1,000 Guineas, Oaks, Coronation Stakes, Nassau Stakes, St Leger and Park Hill Stakes before meeting defeat in a visit to France, in the Prix de Conseil Municipal at Longchamp, on heavy ground after an exhausting journey. Brigadier Gerard (1968), whose wins included a 2,000 Guineas, Sussex Stakes and Champion Stakes at three and Eclipse Stakes and King George VI and Queen Elizabeth Stakes at four, was famously beaten by Roberto in the York race that is now the Juddmonte International, Frankel’s next target. The US star Zenyatta won her first 19 races before going under by a head in the Breeders Cup Classic two years ago.